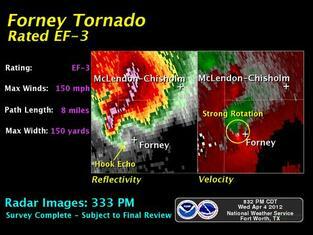 On April 3, 2012, the City of Forney, Texas was heavily impacted by an EF3 tornado. This is their online recovery network. 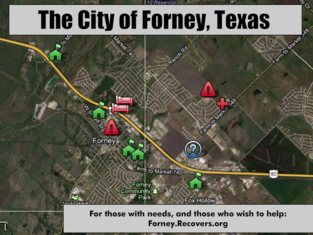 If you were affected by the April 3rd tornado that struck Forney, we still have assistance available for you! Need 30 Volunteers in Royce City on Saturday! Need 25 Volunteers in Forney on Saturday! Saturday we will be meeting volunteers in Forney at Mustang Creek as well as in Royce City @ Authentic Church on hwy 276. Pastors Clint & Angela 214-535-0979 . 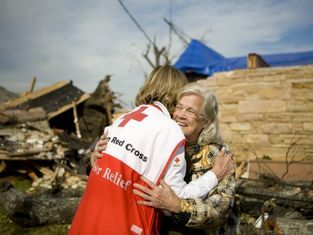 Update: Lancaster Tornado Volunteers Needed! The city of Lancaster has a great need for volunteers. Please consider coming out Monday to help serve these hurting people! Lancaster Tornado Relief, 643 Wintergreen, Lancaster, Tx - Look for two large white tents. This weekend, we are directing volunteers to Royse City/Blackland. We are staging out of the Bent Trail Estate 548 at Munson Rd. We will also need help moving the donation distribution center from Authentic Church to a nearby warehouse. Lions Club/Mustang Creek: Lions club is joining Mustang Creek Church to fill the field by DC with eggs for a huge Easter Egg Hunt on Sunday afternoon @ 12:15 Everyone's welcome to participate! Folks, please be patient (as I am having to remind myself at this moment) and understand we are dealing with a volunteer effort and things aren't always as smooth as we would like.